American homes can be huge castles, but Japanese homes are, and I quote, rabbit hutches. How are Japanese gamers to know if their matchbox-sized apartment can handle Kinect? This is how. Maybe. 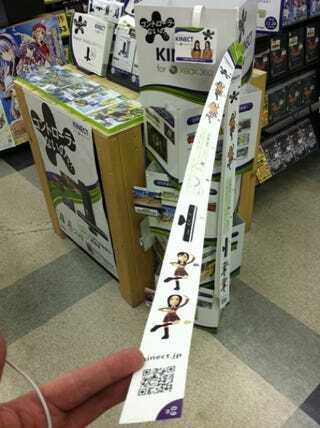 Xbox Japan's Kinect displays have 0.9 meter (2.9 feet) paper measure for gamers to take home and suss out their gaming quarters. 2.9 feet? Kinect needs around 8 feet to hit the sweetspot of certain games. This Xbox Japan tape measure certainly isn't 8 feet long, which might not only give a misleading impression but would also be annoying to measure with. An 8-foot measure would provide Japanese gamers with a better representation of what they are getting into. Yet, at the same time, that could be off putting. There has been concern about whether Kinect can be enjoyed in small Japanese living rooms. "We know that living rooms come in all shapes and sizes," Microsoft told Kotaku back in March, "and have conducted numerous play tests to ensure everyone will be able to jump off the couch and into the fun." Shame everyone's living room isn't as big as this space at Konami's Tokyo offices. It's a shame that everyone's living room doesn't have Konami arcade games in it!